These racial differences in patterns of talar articular facets for calcanei were probably genetically determined and not a developmental response to physical activities. Pattern of the talar articular facets in Indian calcanei. Patterns of the talar articular facets of Egyptian calcanei. 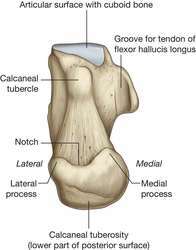 Variations in the talar articular facets in Egyptian calcanei.